One of the longest continuous instrumental temperature records dating back to 1659, the Central England temperature record shows 2014 was the warmest year on record with a mean temperature of 10.93 °C, narrowly ahead of the previous record of 10.87 °C set in 2006. Averaged across the UK it was also the warmest year on record with the annual mean temperature at 9.9 °C, which was 1.1 °C above the long-term (1981-2010) average and beat the previous record of 9.7 °C set in 2006. Eight of the top ten warmest years for the UK have occurred since 2002. Northern Ireland was slightly cooler coming in at third warmest year on record behind 2007 and 2006. All other UK regions experienced record breaking warmth. The heat was evenly spread through the year and the seasons with no monthly temperature records set, with only August having below average temperatures. As well as getting hotter, the UK is also getting wetter with 2014 being the fourth highest total on record for the UK in the series dating back to 1910. Five of the UK's top six wettest years have happened since 2000.
Who can forget the images of storms battering the Devon and Cornwall coasts in January and February 2014 causing inland and coastal flooding, and coastal erosion threatening houses and the Dawlish railway line. On prelimuinary data the WMO has said that Global temperatures in 2014 will be the warmest on record. The Japanese meteorological bureau have confirmed that 2014 was the hottest year on record. 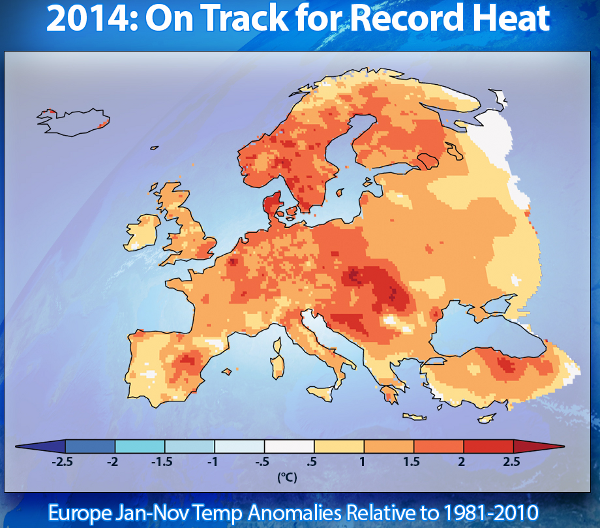 According to Climate Central, Climate Change Played a Major Role in Record European Heat in 2014. 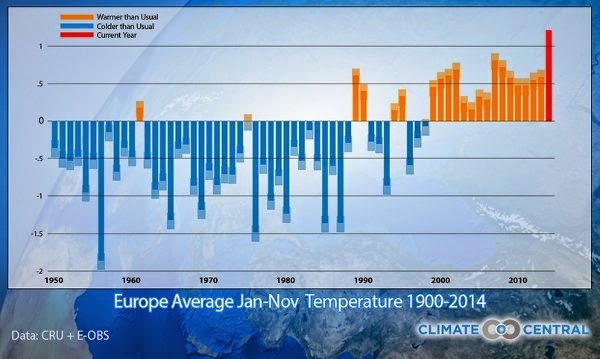 With data up to November Nineteen European countries were predicted to see their hottest year on record: Austria, Belgium, Croatia, Czech Republic, Denmark, France, Germany, Hungary, Iceland, Italy, Luxembourg, The Netherlands, Norway, Poland, Serbia, Slovakia, Slovenia, Sweden (equal to 1953) and the United Kingdom. For the US, NOAA announced that 2014 "ranked as the 34th warmest year since we began keeping track in the 1895, while the temperature exceeded the 20th Century average for the 18th consecutive year." Strong Arctic warming producing changes in the Jetstream with blocking ridges and movement of the polar votex over eastern United States producing a range of temperature variability across the lower 48 states with western states of Arizona, California, and Nevada each having their warmest year on record. Alaska also set new temperature records. NOAA National Climatic Data Center, State of the Climate: National Overview for Annual 2014, published online December 2014, retrieved on January 9, 2015 from http://www.ncdc.noaa.gov/sotc/national/2014/13.